February 1984 — The Old Orchard Shopping Center in Valencia is the primary filming location for ZZ Top’s 1984 music video, “Legs.” Among the stores featured are Kinney Shoes (as “Yolanda’s Shoe Salon”), Isadora’s discount clothing store and Country Girl Fashions (dressing room scenes). Directed by Tim Newman, “Legs” was the third and final music video from the band’s 1983 album, “Eliminator,” the others being “Gimme All Your Lovin’” and “Sharp Dressed Man.” The series introduced the iconic “Eliminator” car — a fire-engine red 1933 Ford three-window coupe — as well as the Eliminator girls: Danièle Arnaud, Kymberly Herrin and Jeana Tomasino (who later married baseball’s Matt Keough to become Jeana Ellen Keough). The “Legs” video introduced the furry, spinning guitars. Like a silent movie, the video uses pantomime to tell the story of a shoe clerk (Wendy Frazier, who turned 21 on the set) who is teased and harassed until the Eliminator girls show up and put everyone in their place and the ethereal band members pop in and hand her the keys to the car, to the envy of those who had ostracized her. All three band members — bandleader Billy Gibbons, bassist Dusty Hill and drummer Frank Beard — appear in the video, but only Gibbons, on lead guitar, was present for the studio recording in 1983. The rest of the music was created by engineer Terry Manning. Filmed in February and released in May 1984, it was the inaugural winner of the MTV Video Music Awards in the Best Group Video category. The song reached No. 8 on the Billboard Hot 100 in the U.S. and No. 13 on the dance charts. Some filming (possibly the make-up shooting) was done at a shopping center at Van Nuys Boulevard and Nordhoff Street in Panorama City. The Eliminator car has been the subject of legends involving sightings and possible thefts. 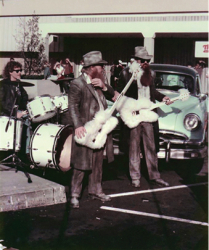 One of the more plausible theories is that owner Billy Gibbons had one or more lookalikes made for taking on tour while the original, which was used in the videos, stayed at home. The Old Orchard Shopping Center opened in 1965 and, along with the Valencia (Big V) golf clubhouse, was the first vertical development in The Newhall Land and Farming Co.’s “new town” of Valencia.